HH: What is your current favourite piece of repertoire and why? At the moment I’m particularly enjoying working on ‘Five Sketches for Viola’ by Elizabeth Maconchy. I really like the different characters in each sketch, and I think that the pieces are a great example of how much the solo viola can do. I’m looking to include the ‘Five Sketches’ in one of my solo viola recitals next year. HH: How did you select the repertoire for your upcoming Borough New Music recital on Tuesday 27th November 2018? What should we listen out for? I really wanted to showcase music by female composers, and I selected the individual pieces because they moved me in some way. ‘The Cresset Stone’ by Hilary Tann, starts with such dark colours, but opens up in places with a beautiful tenderness, while in ‘Whispered Lullaby’ by Dobrinka Tabakova, I love being able to sing through the viola to this serene music. As soon as I heard ‘Urban Hootenanny’ from Amanda Harberg's 'Philadelphia Suite' I knew that I wanted to learn it, and I won’t give too many clues away about the premiere! HH: Of course, you will be premiering a new work by Sadie Harrison - can you tell us anything about this piece? HH: Tell us more about your commissioning of work for 'singing violist'. How did the project come about? What are the unique challenges of performing repertoire of this type? In a sense, the project came about rather by accident! It was over a year ago that Sadie mentioned writing something for singing viola, and around the same time I heard a fellow violist perform ‘Bellatrix’ by Jeffrey Ryan, a dramatic piece which features singing as well as breath sounds and war cries. This led to me discovering ‘Out of the Night’ by John Tavener, which was the first singing viola piece that I performed, and then to commissioning a number of works for singing viola player. Combining the viola and voice has really resonated with me, and I’m really enjoying the challenges that it brings. The hardest thing about this repertoire is performing as if I am two soloists at the same time, as in this music both voices are equal! At the start of the process I try not to be too prescriptive – I want the music to be the most important factor, not length or difficulty. Further into the process, with the first drafts, I can start to get a feel for the music and work out the logistics of translating this to the viola (and voice!). If there’s something that I find particularly difficult, I will always try to find a way to play it, instead of ruling it out straightaway – I find that this helps me to develop as a player. I also don’t mind making changes to the music near to (and sometimes even on) the day of the performance – this adds to the excitement of creating something new. HH: You perform in such a variety of different contexts, from orchestral performing to chamber and solo recitals - can you tell us more about this? Do you have a preference of performance type and if yes, why? One of the things that I love about being a musician is the opportunity to perform in so many different contexts. I prefer the mixture more than focusing on just one type of performance, especially at this early stage in my career. I like to take part in projects that I think will be engaging and that resonate with me as an artist, whatever type of performance that is. I had a wonderful time working on orchestral music this summer at the Lucerne Festival Academy, but I also enjoy the intimacy of playing chamber music and connecting with the audience through my solo viola recitals. It’s this combination of musical projects that I find the most rewarding, especially when they focus on contemporary music! HH: What musically inspires you the most? Other musicians! I find that playing with other like-minded performers always leaves me feeling inspired. There’s so much to learn from other players on any instrument – I’ve found more recently that working with singers and wind players has taught me a lot about breathing, while working with string players inspires me to want to keep improving my technique. When I learn a new piece of music I spend a lot of time thinking about what it’s trying to express, and discussing these ideas with performers and composers is always thought-provoking, whether you have differing views or the exact same idea. ‍HH: What have you got coming up next? In the next few months I have a number of projects that I’m looking forward to. I will be launching a new viola duo with Sarah McCabe called The Viola Viola Duo, and we will be focusing on music for this unusual combination, as well as commissioning works from a number of composers for two singing violists! Later this month, I am going to be recording a video for The Contemporary Viola Sessions which will be posted online, and in December I will be performing in the newly established London Contemporary Music Festival orchestra, with world premieres by Elaine Mitchener and Neil Luck. 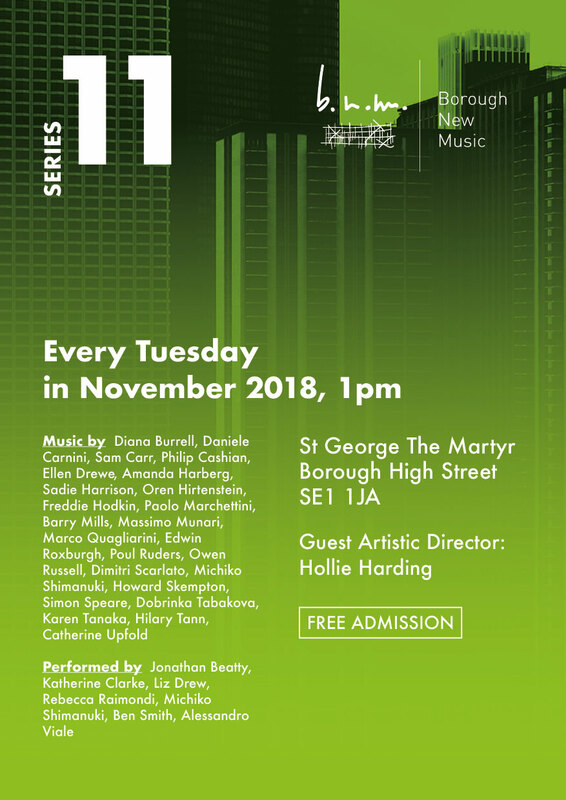 You can hear Katherine performing at Borough New Music, Series 11, St George the Martyr Church, Borough SE1 1JA. 1pm on Tuesday 27th November 2018.